Somatheeram Ayurvedic Beach Resort Kovalam, Somatheeram Ayurvedic Resort Kovalam, Reservation for Hotel Somatheeram Ayurvedic Beach Resort, Kovalam, India. 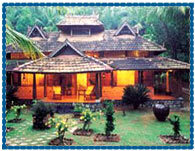 Address: Kovalam, Trivandrum - 695527, India. Accessibility: 21 kms. from Airport, 21 kms. from Railway Station, 21 kms. from Bus Stand. Somatheeram Ayurvedic Beach Resort is the first Ayurvedic Beach Resort Company of the World, sitting atop a hill, rich in culture, tradition and overwhelming natural splendour. It is an ideal hideaway with comfortable and captivating surroundings, homely and attractive services, Ayurvedic Center, Yoga and Meditation. Somatheeram has 50 villas offering a choice in traditional wooden houses, stone bungalows and cottages with all the modern facilities. Banquet Halls, Restaurants, Multi-cuisine, Business Centre, Conference Facilities, Shopping Arcade, Ayurvedic Hospital, Yoga, Beach Games, Indoor Games, Doctor on Call, Laundry, Money Changer, Safe Deposit Locker, Travel Desk Service.